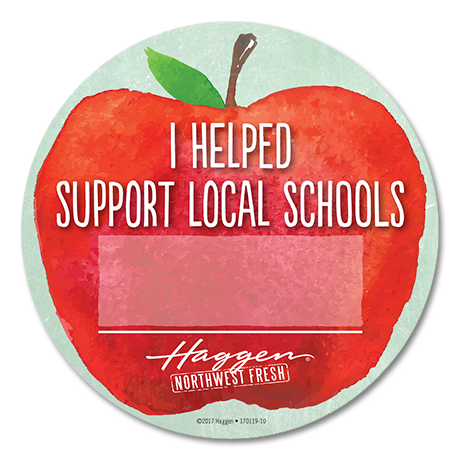 Join us in supporting our local schools this year by making a donation at any Haggen checkstand January 17-30 through the purchase of a $1, $5 or $10 apple cutout. Haggen will match your donation up to $20,000! Your donations will be used to fund local classroom projects through DonorsChoose.org, a non-profit, online crowd-funding charity. DonorsChoose.org makes it easy for us to support local schools (K-12 public schools) that are in need of school supplies. Projects funded include field trips, school supplies, laptops, instruments, classroom furniture and more. Haggen Store Managers will personally select school projects in their neighborhood and fund with customer donations and our matching contributions. For more information on how to post a project go to DonorsChoose.org/teachers. Click here to learn more about Haggen’s giving on DonorsChoose.org.